Happy Women's International Day!! 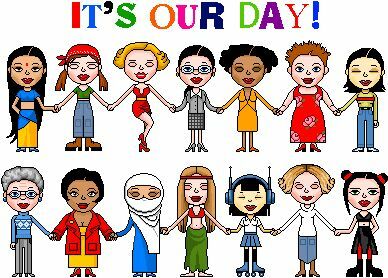 !Today is the day we celebrate all the women around the world!! Why?? Do we really need a reason? Never de-value your worth as an amazing woman. Women have the power to do whatever they want to. Stop setting yourself limits. Go for what you want and become great! Second best isn't an option....at all!! I love being a woman because of the power I possess. I am a strong individual who loves the fact that my inner soul can empower and uplift other women. I love that I can walk past a man and make him drool, without saying a word. I love that the love I have is unconditional and reaches beyond my heart. We are the life-givers. The nurturers. The heart of the household. Never let anyone tell you, that being a woman is less than. Not good enough to be equal. Yes we have a lot to do before we are seen as equals with men... but one thing is for sure. Men could not live without us!! Let me know below...why do you love being a woman?